When looking to grow your Instagram page it can often feel like a very high mountain to climb and you can sometimes feel that you’re never destined to reach the many thousands of followers that some Instagram accounts have already accumulated. I’m going to give you 7 handy tips on how you can go about changing this. I myself have an Instagram page with over 300 thousand followers which only continues to rise daily so I feel I have some relevant knowledge on this topic and I believe I can also help you with your Instagram account whether it’s for business or personal purposes. When I started my Instagram page back in 2012, Instagram was still in the early stages of development and nowhere near as many people were using it and interacting with it like they are today. This meant that although there weren’t as many people on it I was still able to take advantage of this by creating a unique Instagram page to encourage interaction and engagement which allowed my page to grow over the years. Now though pages must be a lot cleverer if they want to grow their following and hopefully my handy hints will help push your page in the right direction. Instagram has more than 300 million active users who all tend to have very high user engagement levels and their engagement with brands are almost 10 times higher than Facebook users and it’s extremely important for marketers now thanks to the announcement of various business tools such as the ability to create ads and the incorporation of analytics. Unless you’re a world renown celebrity or a business phenomenon it can take time to build a strong Instagram presence but it doesn’t mean your profile can’t be a success and that’s where my 7 handy tips will fall into place. For the people that might be new to Instagram and don’t really know how Hashtags on Instagram work, essentially, they are used on your photo posts which allows your photos to be viewed by other people as they can expose your images to a large and targeted audience. Finding the relevant hashtags can be a difficult task but due to the fact you can have up to 30 hashtags per post there is a huge opportunity to explore and find out which hashtag will work for you. Try to keep the hashtags as relevant as possible and get them to describe what is happening in the photo as this will create more traffic to your profile. It might also be worth having a look at what your direct competitors or peers are hash-tagging on their own similar photos to see what hashtags they think are working for them. One useful tip that has worked for me in the past is getting your followers to tag their friends on your Instagram posts. A great way to encourage this is ask your followers in your post’s caption to tag friends which could be in response to several different topics for example you could ask your followers to tag a friend they would take away on holiday with them. Hosting a photo contest on your Instagram is a good way to spread awareness of your brand as well as encouraging activity to your page, as people start to get involved with the contest and share their pictures. Creating a contest which is close to an upcoming event is always a good idea as it makes your audience more aware of the event and encourages them to share and post photos. 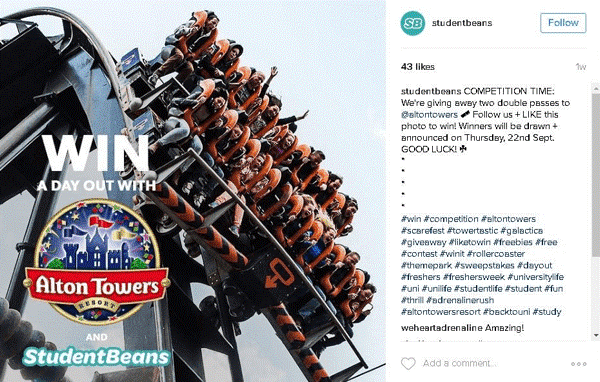 A good example just like the Alton Towers competition by student beans is to share a photo which is eye catching to your audience and makes your users want to take part in the competition and share it with their friends. Although it can sometimes feel like trying to learn a foreign language by keeping up with modern trends and you may struggle to get your head around them, but some of the trends are worth using and learning about. For example, emojis are becoming ever increasingly popular with the mobile market and it acts as a useful way to express emotion into your posts. 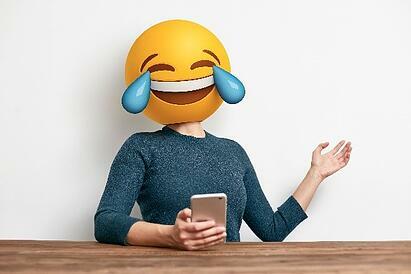 More and more companies are using Emojis on their own personal accounts now as it creates a good rapport with customers and it gives their brands personality. Having the ability to post on a regular basis is extremely important if you want your page to increase its user engagement, most accounts post one photo daily as this tends to be the best way to share content without spamming a person’s feed which could disinterest followers. Accounts with more followers tend to post on a more frequent basis with around 2-3 followers a day, generally the more successful the account the more photos they will share on an average day. I’d advise that if you are running a business-related Instagram page that you look at finding a platform you can schedule effectively on so that you can set your posts up at the beginning of the week and have a consistent structure to all your Social Media posting such as Hootsuite which allows you to control and monitor all your pages. Making sure that you are posting across all your social media channels is a good idea for exposure as it ensures that your existing fans know that you’re on Instagram. Embedding Instagram Photo’s in your own blogs will also be a good idea to encourage people to follow your Instagram page as well as incorporating an Instagram page to your Facebook page. Cross promotion enables you to automatically post pictures across the various platform at a touch of a button so it’s well worth taking into consideration. 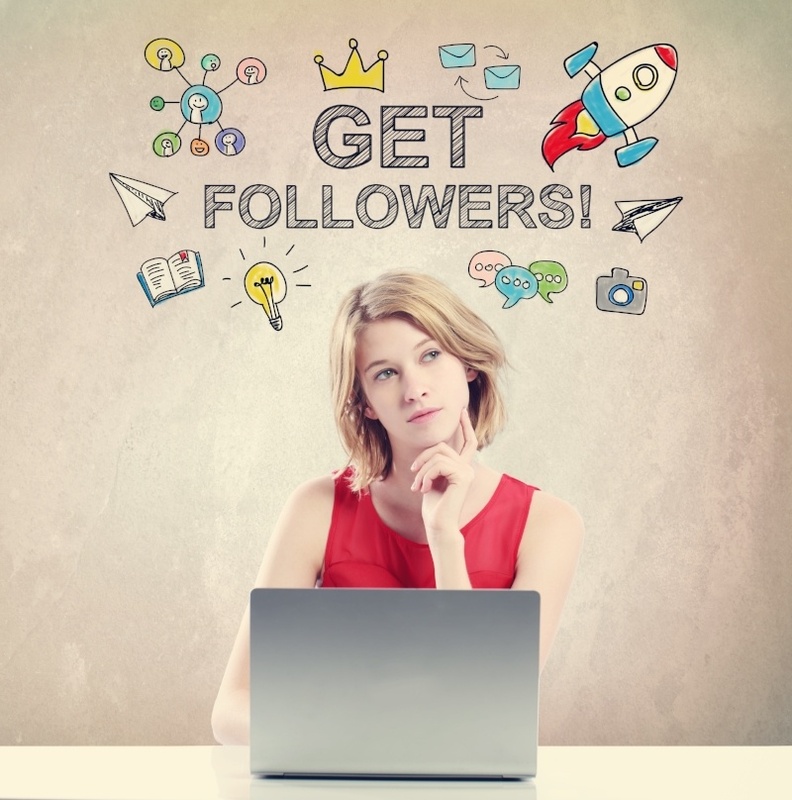 An easy way to acquire new followers and promote engagement is by taking the time to follow and like similar pages content to ensure that you keep your page active and to reach out to pages that may be interested in your content. Other Instagram pages are a lot more likely to notice you if you follow this simple tip. Try to be consistent with your content and experiment with posting at different times of the day to see when your page gets the most traffic.